If you don’t like how a company is doing its business, then sell the stock. That was the longstanding advice to individual investors, because one shareholder is unlikely to change management’s course. Now, though, mutual fund companies increasingly are involved in activists’ struggles to overhaul errant companies. This means that individual investors can be part of a collective effort to hold executives to account for underperformance, overly generous pay or other policies that deplete shareholders’ returns. A case in point is activist Carl Icahn’s effort last year to boost struggling computer maker Dell’s buyout offer to take itself private. Two large fund companies, T. Rowe Price and Southeastern Asset Management (Longleaf funds), backed Icahn. Although Icahn and his money manager allies didn’t get the offering price as high as they sought, they did convince founder Michael Dell to raise it. Even so-called passive funds or index funds and exchange-traded funds (ETFs) often have specialists to manage structural changes at the companies where they invest. Investors should consider this added support when thinking of buying individual stocks or funds. Whether they care or not, investors are asked to vote on a whole spectrum of corporate restructuring every year. Perhaps a company seeks to repurchase shares of its own stock. Or it plans a merger to take advantage of economies of scale. Or it wants to spin off so-called nonessential operations. Companies hire and fire new directors. All of these changes require a shareholder vote. But becoming an educated proxy voter is no simple task. You could spend weeks researching a possible buyout and still not have the slightest clue whether it is a good idea. It’s no surprise to find that most retail investors of directly held stocks decline to cast their ballots. But by opting out, investors are communicating to the executive managers that they simply don’t have time to care. Quite naturally, when stockholders act like absentee landlords, corporate executives have less accountability. The delicate balance between corporate stakeholders can quickly become abused. Investing in mutual funds and ETFs offers an efficient solution for investors to engage in corporate governance issues. 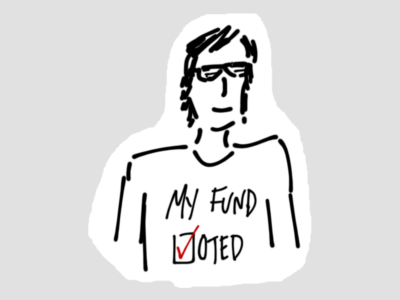 When you purchase a fund, you authorize fund managers to vote proxies on your behalf. This empowers specialists who have the time and expertise to research these important matters. Large fund companies carry significant power. As aggregators of many clients’ investments, some are the largest shareholders of American corporations. For example, Vanguard, Invesco, Fidelity and State Street are the largest shareholders of Apple (APPL), the world’s biggest company by market value. Unlike smaller investors, when large fund investors observe unhealthy management practices, they can do something about it. For example, Dimensional Funds reports where it successfully joined in efforts to reform a family-run hair-care products company, Regis Corp. (RGS), that allowed nepotism to harm its investors. According to proxy materials, one family member received commissions for selling life insurance to the company. Another got paid excessively to lease family artwork for the offices. To make matters worse, the family instituted a poison pill – an anti-takeover technique where incumbent management allows friendly shareholders to buy extra shares – to ensure that others couldn’t encroach on its power by making buying up the stock hard. All of this was going on while the company was struggling to turn a profit. After unsuccessful negotiations with management, Dimensional Funds voted in support of directors whom other dissenting investors endorsed, known in Wall Street parlance as a proxy fight. These insurgent directors won seats on the board and quickly changed the harmful investor policies. Large fund companies can also be quite effective at encouraging companies to institute investor-friendly management policies before they turn into a proxy fight. For example, executive compensation is a hot button issue for many investors who see the salary and benefits of the top dogs skyrocket relative to investor returns over the last decade. But these issues are no longer passing under the radar. Once a bystander in corporate governance battles, Vanguard funds now are involved in many contests to revamp companies that don’t deliver for investors. It issues policy guidance on management compensation to encourage companies to follow investor-friendly best practices. The fund giant warns that it will more likely vote against pay policies that unduly dilute the shareholders’ interests. Last year, it was in the thick of the successful proxy contest at Occidental Petroleum (OXY) to remove Chairman Ray Irani, whose high pay had long attracted shareholder activists’ ire. Vanguard reports that, in 2013, its funds voted against 12% of the proposed compensation packages, which it believed were too lush for what investors received. Investing in low-cost funds with active corporate governance teams is the most efficient way for average investors to keep management honest and claim a fair share of precious returns. Mailbag: What should I do about a class action lawsuit against one of my mutual funds? Mailbag: What Cost Basis Method Do I Want For Vanguard Mutual Funds?